DARPA has just approved for public release a video of this awesome project: a fully controllable robot arm that can be inflated and deflated like a balloon. The AIRarm is lightweight, inexpensive, and stows compactly. It’s inflated and deflated with an on-board pump, and uses actuators and strings to move its joints without embedded motors. While regular PackBot 3-link arms are between 15 and 20 pounds, the AIRarm system only weighs about a tenth of that, a fact that would be much appreciated by the soldiers that have to carry these robots around. Despite its light weight, AIRarm is no slouch, and can lift up to five pounds, or possibly more depending on how much its inflated. By varying the level of inflation, it’s also possible to vary the level of compliance of the arm: this makes the arm a little bit flexible when you need it to be, which in turn makes it safer and more durable. Since it’s mostly made of fabric and string, it’s wicked cheap, at least compared to a conventional arm. Yes, it’s completely inflatable, yes, it can walk, and it is also worth mentioning that it kinda reminds us of this crazy thing. 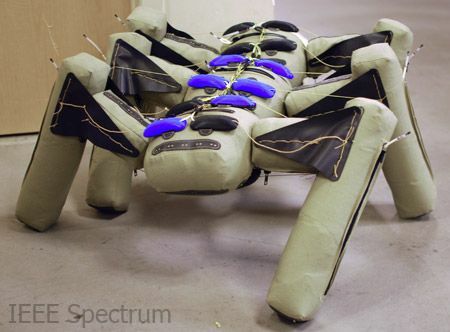 iRobot was just awarded a $650,000 contract from DARPA to continue working on inflatable arms as part of the M3 program, so we’ll definitely be seeing more of this stuff in the near future.